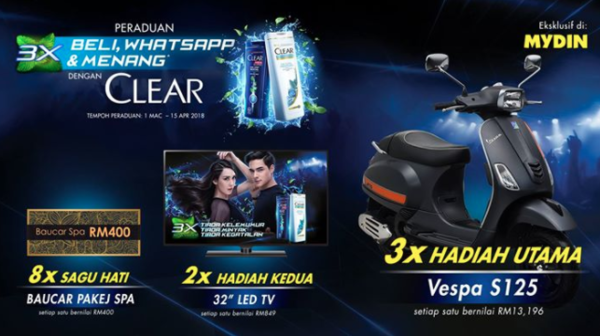 Purchase CLEAR products in MYDIN and spend only RM15, whatsapp to organizer to register, you could stand a chance to win great prizes including a scooter and a LED TV! Answer one question - "Adakah Ice Cool Menthol salah satu varian CLEAR?" and write down the answer "YA" or "TIDAK" on the proof of purchase. WhatsApp to 017-3360728 in a single message, showing the purchasing date and time, receipt number, CLEAR products, and total amount with the correct answer. First Prize x 3: One (1) scooter VESPA S125 worth RM13,196 each. Second Prize x 2: One (1) LED TV 32” worth RM849 each. Consolation Prize x 8: One (1) SPA PACKAGE voucher worth RM400 each.